Brisbane Band 161 – Sing ’Til You’re Hoarse! Featuring ONLY the greatest mega-hits from the 60’s, 70’s, 80’s, 90’s and today – if you can’t sing it, Brisbane Band 161 don’t play it! Re-inventing history’s smash-hit songs through mind-blowing medleys, alternate lyrics and contagious comedy, Brisbane Band 161 Live Party Band is a smash, and not-to-be-missed experience. Storming through nothing but MONSTER-HITS from the last 5 decades. Brisbane Band 161 is the ultimate night-time party band, and guarantees your evening will be a dance floor SMASH! With band members sharing more than a decade of world-wide touring experience, Brisbane Band 161 knows specifically what elements trigger a fabulous party, and that’s combining genuine smash hits with great audience interaction! Whether it be a hit song from as far back as the 60’s, right up to today’s monster hits. Thank you so much for such a great performance at hubby’s 60th Birthday Party at Esk QLD. Everyone, from 10 to 80, got up to dance and sing along – it really made the party! Hope you didn’t mind playing in the old dairy 🙂 Really special. Would recommend this band to EVERYONE ! A big thank you to Band 161 for creating a great atmosphere at our Corporate Event at Archerfield Speedway. 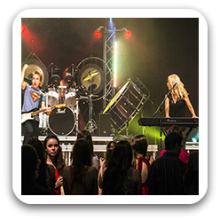 Everyone loved their performance and would highly recommended them for any event. Thank you so much for performing at my husbands 50th birthday party. We can highly recommend this awesome band. They playing a great variety of music and had our guests dancing. We even got to aing with the band! They are great people and happy to chat with you to het the beat out of the performance. It really made our party. Thanks again. A note in appreciation for providing such a high standard of entertainment at our party on Saturday evening. It was so nice that you personalised the night, by letting me near the microphone! Many guests have sent us messages of thanks commenting on how great the band was. So ‘THANK YOU to YOU ALL’ for playing the extra set, that was definitely needed, and for helping to make our party so enjoyable, memorable and entertaining. With your vast range of ‘dance to’ hits, you certainly know how to read a crowd, and bring a party to a climax.